Members of the Fulton Lions Club, a representative of AmeriCorps, and several AmeriCorps volunteers spread new mulch and created a landing area around a slide recently as part of a cleanup project at Fulton’s Oswego Falls Park on South First Street, said Gail Holmes Fulton Lions Club president. This is the sixth consecutive year that the club has made work at the park one of its annual projects. 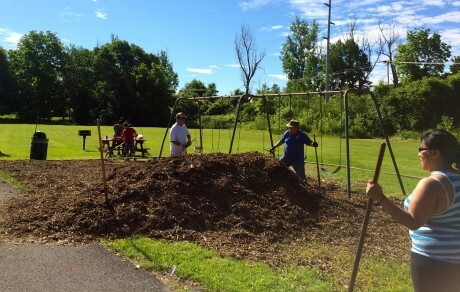 Members of the Fulton Lions Club, a representative of AmeriCorps, and several AmeriCorps volunteers spread new mulch and created a landing area around a slide recently as part of a cleanup project at Fulton’s Oswego Falls Park on South First St., said Gail Holmes Fulton Lions Club president. AmeriCorps Leader Astry Vasquez (far right) joins Lions Len Kellogg (center), and Steve Young, (right center) in spreading new mulch at the playground. Holmes said. “We needed to dig a six-inch deep base around the slide, then fill it in with mulch to create a softer landing area. “During the past five years, the Fulton Lions Club has resealed the basketball court, painted the basketball backboards and added new nets. We’ve also cleared brush from the northern perimeter chain link fence, removed stumps, removed an old chain link backstop, and filled in lawn ruts and depressions with topsoil. Fulton Lion Steve Young spreads mulch while Lion Charles McIntyre uses his Bobcat to scoop up another load. 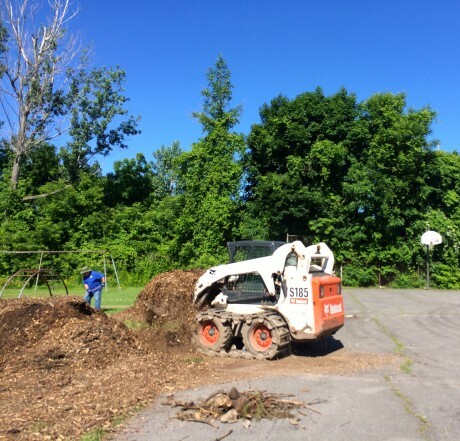 This is the sixth consecutive year that the club has made work at Oswego Falls Park one of its annual projects. Lions who participated in the project were: Steve Chirello, project chair; Len Kellogg, Charles McIntyre, Steve Young, Don LaBarge, and Roberta Boteler. The Fulton Lions Club is part of Lions Club International (LCI), which was founded by Melvin Jones in 1917. It is the largest service club in the world with over one million members in more than 170 countries. The Fulton club is one of the largest and most active Lions clubs in Central New York. Lions Clubs are committed to sight and hearing projects. Fulton Lions provides financial assistance for those in need of eyeglasses, eye exams and hearing aids. In addition, the Fulton club collects used eyeglasses for refurbishment and redistribution at Waby Opticians, Empire Vision Center, Wal-Mart, PathFinder Bank and The Medicine Place. The Fulton club also supports the Guiding Eyes for the Blind program that trains Seeing Eye dogs for the blind, and the Finger Lakes Lions Hearing Foundation. Anyone interested in membership in the Fulton Lions Club, or seeking more information can visit the club’s web site at http://e-clubhouse.org/sites/fultonny/index.php Correspondence can be mailed to Fulton Lions Club, c/o Steve Chirello, P.O. Box 727, Fulton, NY 13069.